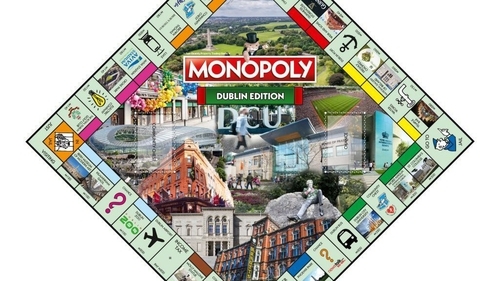 Dublin's stock is most definitely on the rise, and the release of a Dublin version of Monopoly, which launched today, only confirms this. With over 30 landmarks included on the board, it's a curious cross-section of Irish life sure to spur some debate. If you're thinking that you definitely had an Irish Monopoly game when you were younger, you're not wrong. While an Irish-themed board game was released some years ago, it wasn't officially issued by Monopoly so this version - created under official license of Hasbro, the creators of Monopoly by Winning Moves - is, as they say, a "True Blue". The creation of the game itself mirrors some of Dublin's own trends, such as the inclusion of the Phoneix Park, which was initially to be priced in a lower range until Pope Francis hosted Mass there this past summer but skyrocketed to 350 Monopoly dollars (M). The choice of locations and the prices are curious, if only because they're not the typical spots chosen, and there's undoubtedly some good in this. Many will be cheered by the inclusion of DCU over Trinity, while iconic landmarks such as the Molly Malone statue are priced at just M60, the same price as the Ha'penny Bridge. Meanwhile, the most exclusive spots are reserved for locations with national and historical significance, specifically the Phoenix Park (M350) and the GPO (M400). The full list of squares, with prices, is below. As for Community Chest and Chance cards, they are tied directly to beloved Irish institutions and the things that Irish people do best. A Chance card could send you on a shopping spree at Arnotts, while Heart Children Ireland, which supports children and adults with congenital heart defects, scored a Community Chest spot voted in by public vote. Because we still can't shake parts of our rambunctious history, there is not one but two jails included on the board, as Kilmainham Gaol features just two stops from the main jail, still in its traditional corner space. The release comes at a sensitive and politically fraught time for Irish property, as a housing crisis continues to price people of all ages out of settling down, while homeless figures continue to rise. The irony is not lost on many commentators. Dublin Monopoly : you start off with €1000 but the cheapest property on the cheapest street is €5,000.